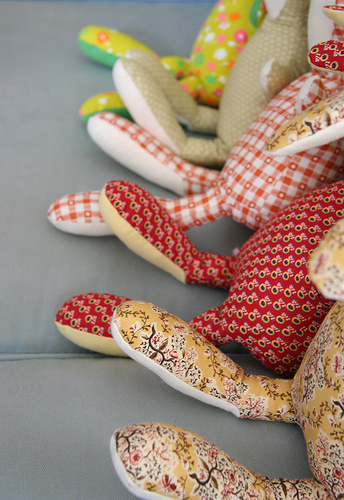 Here’s my line up of new bunnies waiting for tails, faces and dresses. I’m really excited about this batch! I have so many great fabrics picked out for their outfits. It’s good to have a fun activity lined up for the long nights in store for us this weekend, listening to things explode. As always, simply fabulous fabric! I’m excited to see the five new ‘bunny personalities’ evolve. Have fun! You have the best eye for fabrics. I can’t wait to get sewing on my pattern book. Great photo! Very clever. I love all the fabrics! (I even have the one on the first bunny – now I know what I’ll use it for). Super cute fabrics. I love the red one and the vintage-y yellow and green one. Can’t wait to see the finished product! Those feet look great! Have fun finishing them. So tantalising – I’m dreaming of dresses and faces now. Can’t wait to see them in all their glory. Do you think that it is bad for a grown woman to have a crush on bunny feet? Just asking. Can’t wait to see them all finished! awww – look at all the feet!!!! Yeah, our ‘hood is already starting to explode…sheesh, don’t they know I have sleeping kids and one weak tolerance for such noises?! Oh it is a bunny rockettes line!! Sooo wonderful miss wonderful! Can’t wait to see them finished! Do you ever just watch tv? i see some familiar fabric in there!! heeee! !